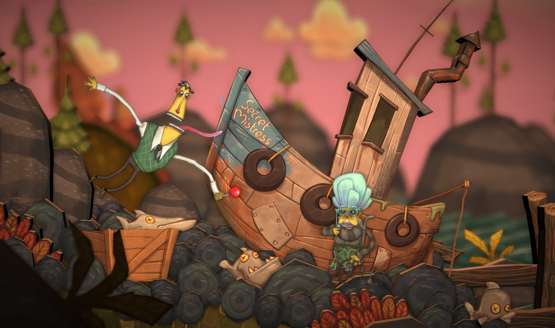 It seems like not too long ago that Zoink released Stick it to the Man, a hilarious side-scrolling adventure that, while expertly written, wasn’t perfect. Next up, they released Zombie Vikings, written by a different writer. Though it featured a similar two dimensional art style, the gameplay was wildly different from Stick it to the Man, being a brawler game. While it offered a lot more gameplay than Stick it to the Man did, it seemed to drag in and get repetitive towards the end. 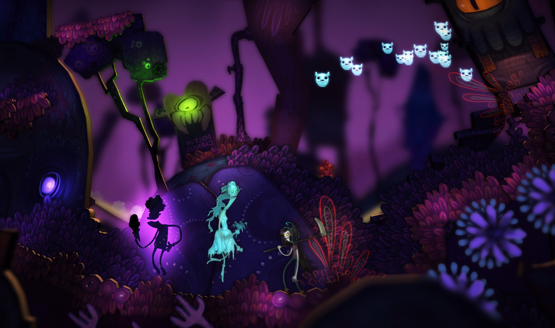 Flipping Death is the spiritual successor to Stick it to the Man, employing many of the same ideas, but taking many things that Zoink learned in the four years since it released to make a better game. Flipping Death is about a girl that is given the scythe when Death decides to go on vacation. It’s really as simple as that. He just kind of hands it over and says he’s out. She has to use her powers to figure out what’s going on in the town, while also trying to solve the mystery of her own death. Death has the power to possess the living, flipping the world around from the world of the dead to the land of the living. You’ll need to use each of these sides in order to solve puzzles and move things forward, including unique abilities that each of the characters in the town can perform. In the world of the dead, you can toss your scythe and warp to it to quickly move about. I couldn’t quite get the hang of doing it smoothly in the short time I was there to demo it, but I’m sure it could offer some very quick traversal once mastered. You need to paint this boat blue and that guy likes licking things. What would happen if he got some blue paint on his tongue? Much like Stick it to the Man, the writing is hilariously witty and bizarre, but this time they opted to write fewer characters overall with deeper stories, connections to the town, and connections to one another. As Death, you can read minds of characters while possessing them, and they’ve all got unique things to say, alone with unique interactions with one another when using their special moves (when possessing the guy that licks things, try licking the grandma). Already I could get a sense for the deeper investment there was into each of these characters over many of the one-shots found in Stick it to the Man. I even uncovered a dark plot regarding the murder of my Death trainer, Lady Moldydough. Challenges will offer a bit of replayability. They aren’t required to complete the game, and their requirements are explicitly listed, but the titles do offer some hints as to what you might need to do while possessing different characters to finish each challenge. Zoink is trying to find the right balance in the game to make sure that it’s not too hard overall, but offers more intriguing gameplay that challenges players a little bit. Judging by some of the fun puzzles that incorporate the uniqueness of each character that I found in this early demo, I’d say they are on the right track. I mean, a guy who can lick things is required to paint a boat (guess how), and grandma can cruise around the world in her wheelchair! Then there’s the evil villain who pokes things. A lot. Don’t worry Lady Moldydough! We’ll find out how you were killed and exact timely vengeance for your demise! Once again, Zoink have captured that bizarre feeling of a strange Saturday morning cartoon with a silly style that is signature Zoink. Flipping Death seems like a hilarious follow-up to Stick it to the Man, and the writing and gameplay both look to be even better this go around. If the rest of the game is anything like the first little bit I was able to get my hands on, then stepping into the shoes of Death, possessing the living, and solving the mysterious case of your own demise will be an absolute delight that keeps us smiling and laughing until the very end. Flipping Death preview conducted at PlayStation Experience 2017.